We slept for almost twelve hours, though I felt like I could have slept for twelve more. When I finally rolled over in bed, the clock read 8AM. 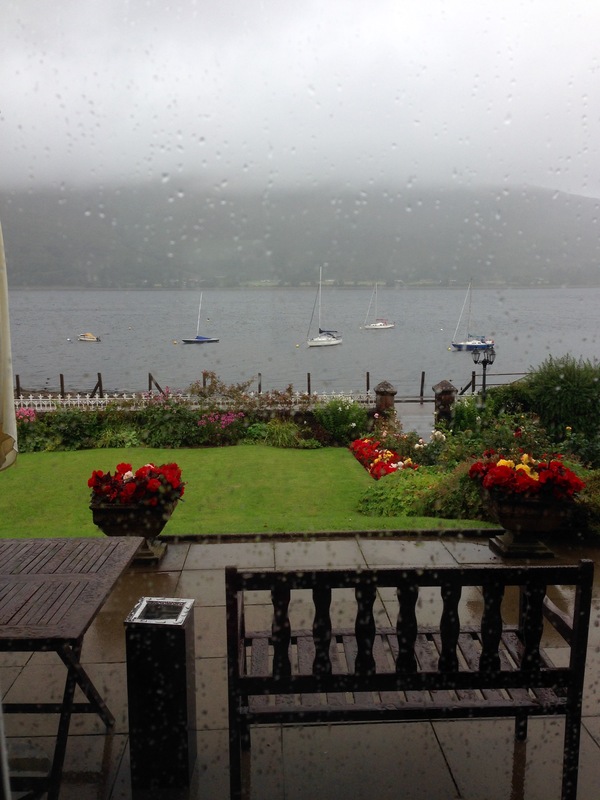 Our plan was to hike Ben Nevis, but, after a glance at the pouring rain outside our window, we began to reconsider. 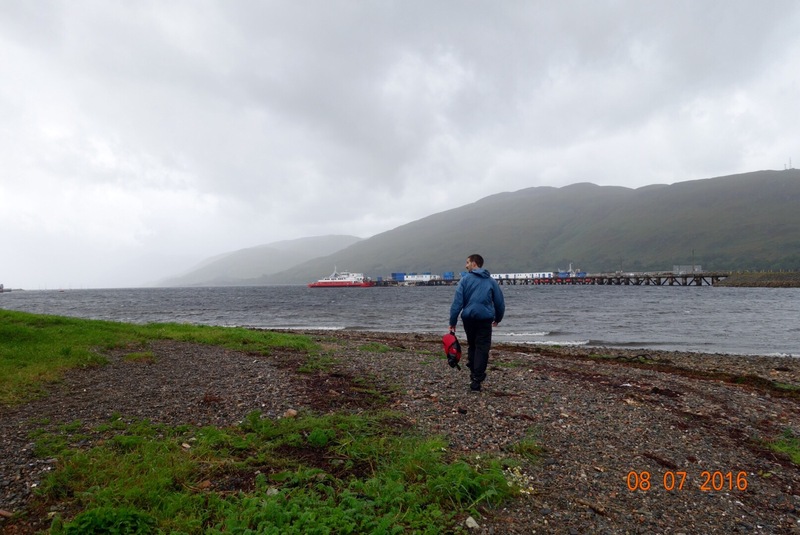 Ben Nevis is the highest peak in the UK, so this plan was a hard one to let go, but as the day wore on and the rain didn’t stop, I eventually accepted that it just wouldn’t be worth it. Chris kept saying, “Let’s just see how the day goes,” up until almost 1PM, because he wanted to make sure that it was my decision to not hike up the mountain, so that I couldn’t pester him with guilt-inducing comments for the rest of the trip about choosing not to do the hike! 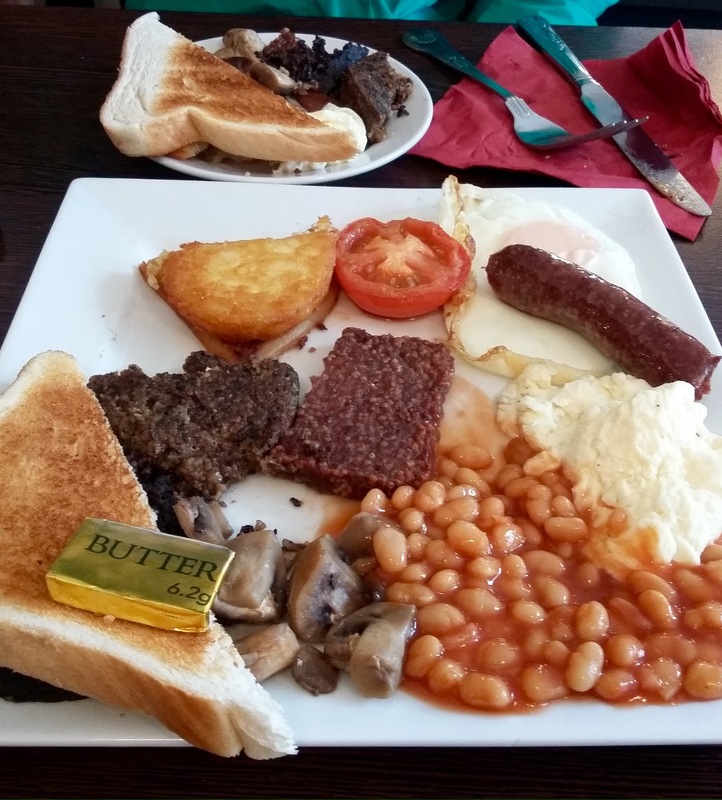 For breakfast, we split a fruit scone and the Scottish breakfast, which included haggis! The meal also included black pudding, and when the plate arrived, it held three similar looking patties. We were unable to determine which was haggis (and we can’t even remember what the third one was on the menu! ), but we still ate and enjoyed them all. Next we went back to our room to find out where the bike shop was on our map. The bed and breakfast we are staying at tonight is about a half mile outside town in the opposite direction of the bike shop, so we dropped our bags off there first. 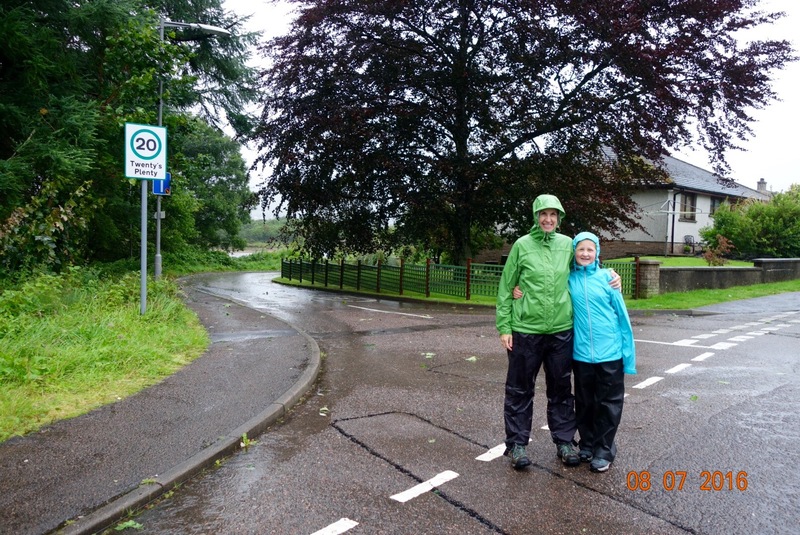 After trudging through the rain, with a stop at the official start of the Great Glen Way and the site of the old Fort William to read information panels, we bought lunch at the cafe inside the grocery store, Morrisons. 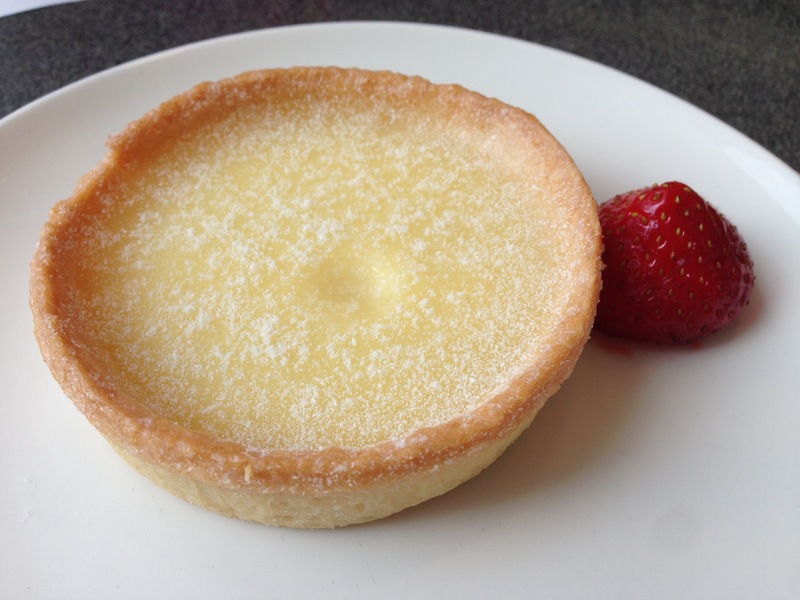 My favorite part was definitely the lemon tart we enjoyed for dessert! Afterwards, we found the bike shop, Nevis Cycles, only a mile outside town, and picked up our hardtail mountain bikes, which we rode back to the bed and breakfast. Just before pulling in, Chris got tidal-waved by a passing car! An afternoon nap was in order, so we checked into our room and laid down to rest our eyes. After less than an hour, I heard Kate’s, my future sister-in-law’s, voice outside our door; Corey, Kate, Maddie, and Ian had arrived! 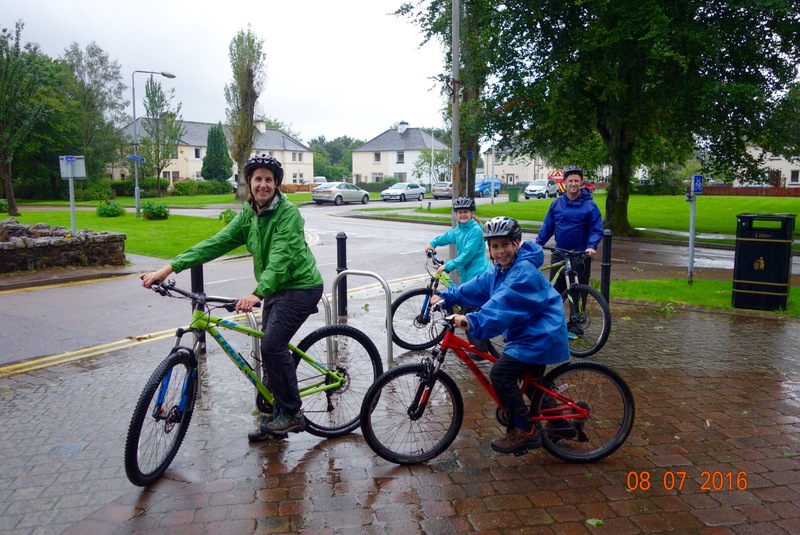 Once they were settled, we all went back out into the rain to retrieve their bicycles. 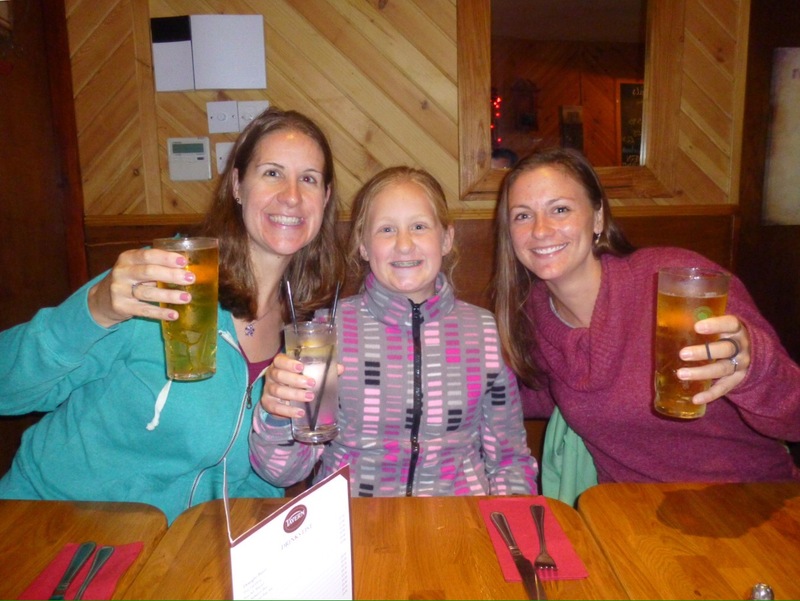 We supped at The Tavern, went back to the B&B to sip some wine, and fell asleep around 11PM. Looking forward to starting the Great Glen Way tomorrow and crossing my fingers for sunny skies! Your B and B has such an incredible view! Eating in the taverns seems to be so much a part of their culture. I remember finding a tavern out in the country surrounded by fields, but they had great food and it was a great way to meet the locals. Hope the sun has arrived. How fun finding a tavern way out in the middle of nowhere! 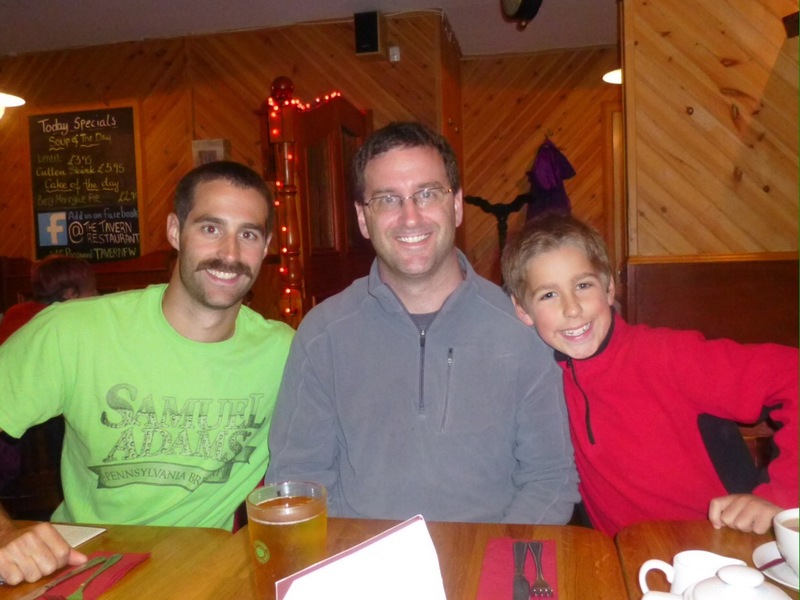 Thanks so much for reading about our trip – we had such a great time! We did get some sun, but even in the rain, it was really beautiful. I remember that first night of sleep when going over the pond from here to there. The long day of travel followed by a long sleep made the timezone adjustment much easier. Hopefully you have good rain gear! Haha I think Chris was really excited to finally get to use his waterproof shoe covers for biking, since we really only had one day of rain on our cross-US trip. Yes – the long night of sleep was excellent!